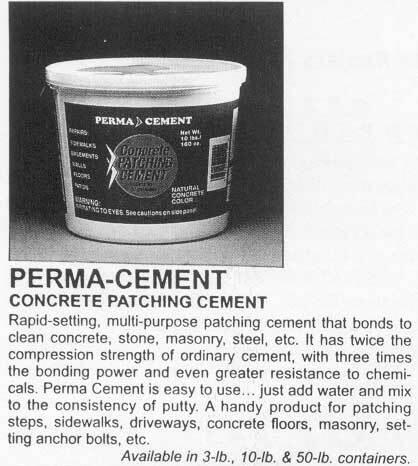 A multipurpose underlayment and patching compound, fomulated for use over concrete, quarry tile and terrazzo prior to installing asphalt, linoleum, asbestos tile, carpentry, etc. It consists of an acrylic resin binder and a composition powder, sold in units of proper proportions for easy mixing prior to use. 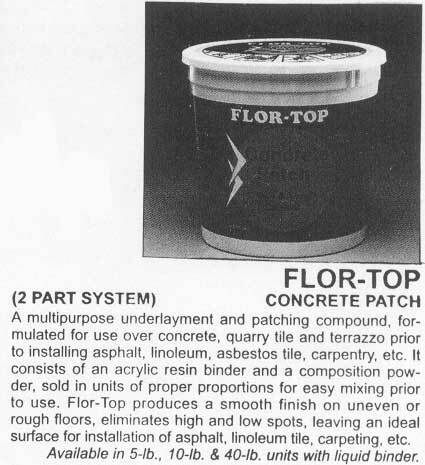 Flor-Top produces a smooth finish on uneven or rough floors, eliminates high and low spots, leaving an ideal surface for installation of asphalt, linoleum tile, carpeting, etc. Available in 5-lb., 10-lb. & 40-lb. units with liquid binder. Description: Rapid-setting, multi-purpose patching cement that bonds to clean concrete, stone, masonry, steel, etc. It has twice the compression strength of ordinary cement, with three times the bonding power and even greater resistance to chemicals. 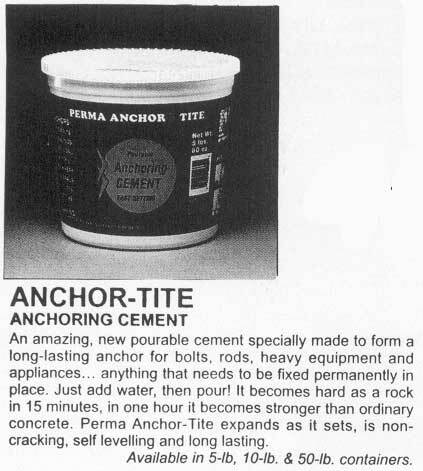 Perma Cement is easy to use ... just add water and mix to the consistency of putty. A handy product for patching steps, sidewalks, driveways, concrete floors, masonry, setting anchors bolts, etc. Description: Bonds new concrete to old .. permanently! For indoor or outdoor use. This white, free-flowing emulsion produces a fast surface ser, increased physical strength, chemical resistance and excellent adhesion to old concrete, masonry brick, wood, metal, glass, etc. 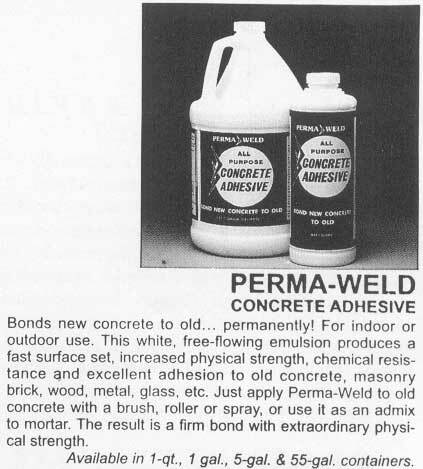 Just apply Perma-Weld to old to concrete with a brush, roller or spray, or use it as an admix to mortar, The result is a firm bond with extraordinary physical strength. 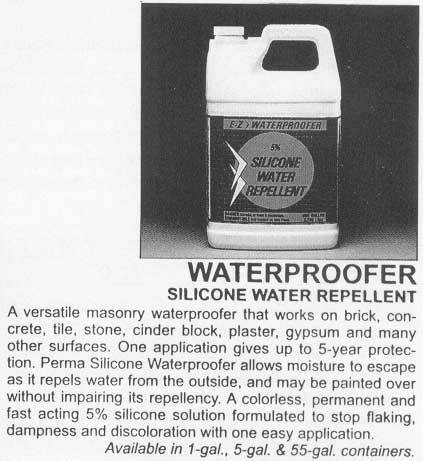 A versatile masonry waterproofer that works on brick, concrete, tile, stone, cinder block, plaster, gypsum and many other surfaces. One application gives up to 5 year protection. Perma Silicone Waterproofer allows moisture to escape as it repels water from the outside, and may be painted over without impairing its repellency. A colorless, permanent and fast acting 5% silicone solution formulated to stop flaking, dampness and discoloration with one easy application. Description: An instant-setting hydraulic cement formulation especially made to patch and repair difficult leakage areas. 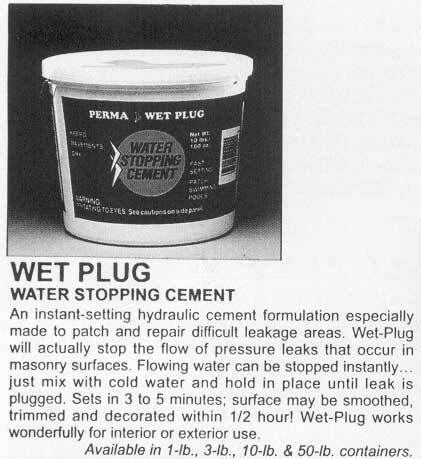 Wet-Plug will actually stop the flow of pressure leaks that occur in masonry furfaces. Flowing water can be stopped instanly ... just mix with cold water and hold in place until leak is plugged. Sets in 3 to 5 minutes; surface may be smoothed, trimmed and decorated within 1/2 hour! Wet-Plug works wonderfully for interior or exterior use.